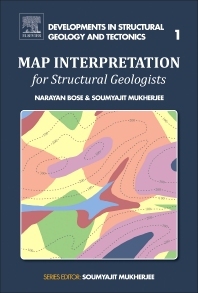 Map Interpretation for Structural Geologists covers various topics, from deciphering topography using contour patterns to interpreting folds, faults, unconformities and dykes. By interpreting several types of maps, this book gives readers the confidence to solve difficult geologic questions related to map interpretation in the classroom and in the field. Interpreting geological and structural maps is an inseparable part of learning structural geology in the undergraduate curriculum and postgraduate development. Narayan Bose is a final year Ph.D. student at the Indian Institute of Technology Bombay, where he did his M.Sc. in Applied Geology (2013). He received B.Sc. (Honors) in Geology from the Presidency College (Kolkata) in 2011 and secured 2nd rank in this program under the University of Calcutta. He is specialized in structural geological fieldworks and micro-structural studies especially related to ductile- and brittle shear zones. As a Teaching Assistant, he has been conducting structural geology fieldworks and practical classes for the Masters programmes in Applied Geology, Applied Geophysics and Petroleum Geoscience. He has also reviewed several manuscripts submitted in international journals, and has published a paper in the International Journal of Earth Sciences (Springer). Soumyajit Mukherjee is a Professor in the Department of Earth Sciences at the Indian Institute of Technology Bombay, India. He received his Ph.D. degree in Geology and M.Tech. in Applied Geology from IIT Roorkee in 2007 and 2002, respectively. He did his B.Sc. with Geology (Honors) from Presidency College (Kolkata) in 1999. He was a recipient of the Hutchison Young Scientist Award from IUGS in 2004. He served as the Guest Researcher at the Hans Ramberg Tectonic Lab, Uppsala University during 2005-2006. Dr. Mukherjee, a structural geologist and tectonician, has been performing fieldwork, microstructural studies, analogue- and analytical modelling, mainly on ductile shear kinematics and collisional tectonics. His research and editorial experience spans 15 years and so far he has authored and (co)edited 12 books. He presently serves as an Associate Editor of the International Journal of Earth Sciences (Springer) and the Series Editor for the Developments in Structural Geology and Tectonics (Elsevier).